Armani wood with brass edgings as the main door. High grade Italian travertine marble walls. Visionnaire by IPE Cavalli chandelier. Fendi Casa, Bentley and Rugiano leather and nubuck furniture. Iridescent Rubelli silk curtains everywhere. And fly-in Italian architects and specialists during construction and completion. È perfetto! 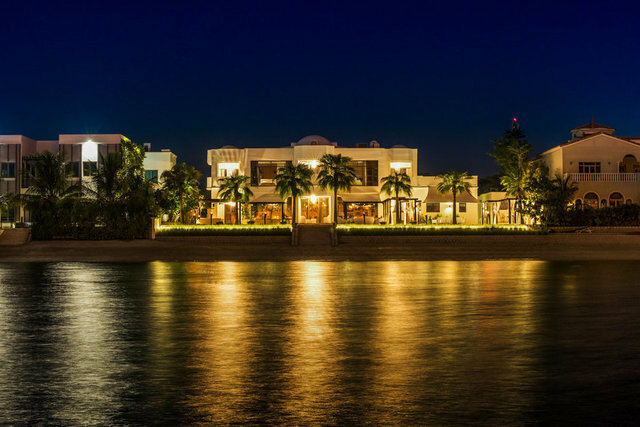 This Palm Jumeirah villa exemplifies a grand canvas of contemporary sophistication. A true demonstration of the owner’s refined taste, this home is passionately conceptualized and executed by MMA Projects based in Milan, with individual teams flying into Dubai. The oversized pivoting front door, with black glass from the outside and high-gloss Armani wood from the inside, is customized by Italian specialists from Oikos Architetture D’ingresso. Fitted with precision, one can swivel it with a finger. A long handcrafted 3D Italian marble feature wall in the entrance lobby offers an extra dimension to the walls; and past the elegant dining hall is the billiard hall – complete with leather furniture, 84-inch 4K ultra-high-definition television and Bose music system. The distinctive elements of this home are its unique collection of designer chandeliers and suspended glass sculptures, including Blanka Matragi’s flawlessly crafted LASVIT “Couture” in the dining hall; six-shade Brunilde chandelier in the beachside living room; the bar’s crystal antler chandelier in 80 kilograms of contemporary crystal handcrafted by Jason Lawson; and the 3.5 meters high x 1.7 meters wide LU Murano blown-glass chandelier dominating the second floor lobby. Extending the grandeur outdoors, this home exhibits contemporary furniture with UV-protected upholstery; 11 x 6 meter swimming pool that gives a turquoise glow at dusk with its underwater lighting; metal torch sconces; and a modern fire pit that gives a gentle warmth during winter nights . Marble steps down to the private beach bare the captivating views of the sea and the Dubai Marina skyline. Other features of this villa include Kahr Nordic wood floorings, Gaggenau kitchen appliances, world-class Somfy motorized curtain system, high-style electric indoor fireplace, independent audio systems, and staff quarters.